Oregon Save Our Schools member Joanne Yatvin comments on the new ESEA reauthorization, known as the Every Student Succeeds Act (ESSA) signed this week by President Obama. Find the original post on her blog, "The Treasure Hunter". Today’s post is a response to the law just passed by Congress to replace No child Left Behind (NCLB). The New York Times published a piece by David L. Kirp describing that law yesterday, which I found clear and accurate. So, if you can go to that article (link), I suggest that you read it first for a more complete description of the law than I can give here. Then read my analysis and my concerns. The major changes in the Every Student Succeeds (ESSA) law are the shift from Federal control to state control and the removal of the rewards and punishments for schools that were used by the the Department of Education to ensure compliance. Yearly student tests will continue, but they will be chosen or designed by the states. In addition, the effectiveness of schools will will be made on more evidence than just test scores. Finally, actions to improve the performance of students in high poverty schools will be the central focus of states for the next several years. Although these changes promise better days for our public schools in the future, I still see much to be concerned about. Like its predecessor, ESSA will operate on the same beliefs about our system of public education, and for that reason states will be inclined to identify the same goals and use similar strategies to reach them. We are not done with judging our students, teachers, and schools mainly by test scores, or believing that comparisons with other countries' scores on international tests are meaningful. Nor, are we done with top-down decision making on what, when, and how our students should learn, in disregard of teachers' knowledge and experience. Many state legislatures--and their constituents--will continue to believe that charter schools, on the whole, are better than public schools and move to increase them. And some of those states will continue to offer vouchers to a few students to attend private or religious schools in the belief that they are throwing life preservers to drowning children. Can these aberrations be stopped? The only ways I see are for parents, teachers, and informed citizens to strengthen their efforts to support our public schools. We need to put pressure on state legislatures to use their funds and power to make intelligent decisions for our schools. If we are silent, thinking that all is well now that NCLB is dead, the future will be no better than the past. I awoke this morning to a C-SPAN rerun of "Newsmakers with Lily Eskelsen Garcia" in which one of interviewers was Emily DeRuy, who covers education for National Journal's Next America project. DeRuy previously reported on politics and education for Fusion, the ABC News-Univision joint venture. Ms. DeRuy almost immediately made the hair on the back of my neck stand up both in her questions to Eskelsen, and in the post-interview analysis where she pretty much trashed NEA for making common cause with the Republicans on accountability and for "breaking with the current administration." She essentially said NEA was now a paper tiger. When her fellow interviewer from EdWeek noted that he would be cautious about that view, she cited declining union membership and was essentially completely dismissive. Early Childhood is the next and even more dangerous route the corporate raiders and philanthropic philanderers intend to take in their quest to control and distort public education. We have already seen that door opened a bit here in Oregon, with the passage of HB 3380, which will cost about $27 million and open around 2,700 additional subsidized preschool spots to 3 and 4-year-olds. As I understand it, a big part of this bill allows for public money to flow to private preschool providers, essentially to ensure that we will be moving toward more "high quality" than would have been the case if all of the money had simply gone to proven programs like Head Start to expand the numbers of kids served. In case you missed it, this one passed at the very end of the session, and only after some hard fought negotiations. Some skeptics believe that it only got done after a big chunk of the change was designated for Head Start programs, causing the Head Start leadership to switch from opposition to extolling the virtues of HB 3380 to the very heavens. Be that as it may, the passage of HB3380 set off a major celebration among the philanthropic "in" crowd, as per this article from The Children's Institute of Portland. SO as I end my thoughtful meanderings, and get serious about my breakfast, I am increasingly worried about just what mischief the entrenched ECC gang will bring to our door going forward. While our "victories" in opting out, helping to hand Kitzhaber his hat, and (hopefully) at least slowing the crazy testing down have been really fun, I think we have just scratched the surface of the powers out there working constantly to "reform" public education into their own privatized and elite vision. We need to keep looking ahead! Increasing Teacher Stress is a Recipe for Disaster! At a recent meeting, it came to my attention that the Oregon Teaching Standards and Practices Commission has been receiving an increasing number of complaints about teachers who have engaged in conduct that is extremely out of the ordinary for them as individuals, or who have acted before thinking, resulting in interactions that were then judged to be unprofessional. The Commission Director indicated that she felt this was an indicator of rising stress in the teaching force. Rising teacher stress is painfully obvious to any objective observer and is approaching epidemic proportions. We must change it before we completely lose the excellent teachers that we now have. But this is only the latest reminder about the scope of the problem that I have encountered. This really should not be news to those who make educational policy. Two different studies now nearly two years old sounded the alarm loud and clear. Unfortunately, both have been alternatively “spun” or just plain ignored. One was the 2012 release of the prestigious MetLife Survey of the American Teacher - Challenges for School Leadership. This was the twenty-ninth in a series sponsored annually by MetLife since 1984 to give voice to those closest to the Classroom. The other is the Gallup-Healthways Well-Being Index (2013). Principal and teacher job satisfaction is declining. Principals’ satisfaction with their jobs in the public schools has decreased nine percentage points since it was last measured in 2008. In that same period, teacher satisfaction has dropped precipitously by 23 percentage points, including a five-point decrease in the last year, to the lowest level it has been in the survey in 25 years. A majority of teachers report that they feel under great stress at least several days a week, a significant increase from 1985 when this was last measured. According to the Gallup-Healthways Well-Being Index, a career in teaching may be the secret to the good life. Never mind the media reports that make teaching in America look like a horrible job; it may be one of the best careers for a person’s well-being. The only obstacle in our way, however, may be the workplace in schools themselves. Despite enjoying top marks in overall wellbeing, teachers rank toward the bottom (eighth out of 14) of the professions surveyed on one very important element of well being: work environment. They rank sixth in saying their “supervisor treats me more like a partner than a boss.” And they are dead-last — 14th, behind coal miners and truck drivers — in saying their “supervisor always creates an environment that is trusting and open.” They are also dead last in saying they were “treated with respect all day yesterday,” and experience the second-highest stress level across all occupations. And according to Gallup’s workplace engagement surveys, 31% of teachers are “engaged,” which ranks sixth overall behind farmers and fishermen, nurses, physicians, managers, and business owners. We have to fix this. Oregon policy makers must heed this continuing message and make teacher motivation our number one education policy priority. Instead of mouthing the catchy but sketchy Lake Woebegone-esque quest for "A World Class Teacher in Every Classroom”, Oregon needs to recognize that our teachers are already a highly skilled and dedicated group and switch their focus to take action to assure a motivated teacher in every classroom. We can and should begin with ending the Smarter Balanced Assessment and its Kafkaesque demands and processes that are causing our teachers to be unwilling accomplices in damaging their kids! Robey Clark, a member of Oregon Save Our Schools, shared with us a letter that was sent to Washington State Superintendent of Public Instruction Randy Dorn by the governing tribes of the Washington State Tribal Compact Schools on June 5th, 2015. Mr. Dorn has yet to respond to the tribes. As Kathleen Hagans Jeskey, of her Teacher Talks Truth blog, (she is also an Oregon BAT and member of Oregon Save Our Schools as well) states in her post regarding the tribal letter, "The sentiment in this letter can be broadly applied not only to Native students but to all students. Our public schools are diverse. Students deserve to have their cultures recognized and respected. They deserve lessons that engage and speak to them, and they deserve to be evaluated in an authentic way. We must bring the humanity back to our schools. " Thank you Robey Clark for sharing this with the public. We, the governing tribes of the Washington State Tribal compact schools, hope to break the chronic cycle of failure among schools serving American Indian reservations. We intend to capitalize upon the opportunity presented by this new Tribal Compact School law by promoting the adoption of teaching practices which we believe to be more congruent with tribal cultures. In support of this effort, we intend to foster some important reforms in educational accountability methods that will encourage and reward a change in practice. In recent decades, state and federal educational policy has focused on raising test scores for poor and minority students up to the general population average by the third grade (or soon after) in an effort to minimize the dropout rate. This policy has been a particular disaster for most public schools serving Indian reservations. The result has been a system that labels Indian children early; subjects them to continued remedial instruction; and fails to keep them engaged after the 4th grade. The over-emphasis on early grade test scores has evolved into a self-fulfilling (and self-perpetuating) prophecy of failure for Indian students. We believe it is this labeling effect, coupled with limited instructional methods that cause many if not most dropouts. The Iroquois Sachem Canasatego once said to the English colonists of his time, “...you who are so wise must know that different Nations have different Conceptions of things and you will, therefore, not take it amiss if our Ideas of this kind of Education happen not to be the same as yours. We have had some Experience of it...”. Our experience has been that our schools have diligently tried to adopt “research based” models and “data based decision making” as primary methods for school improvement for years now. For the past 15 years, federal policy has placed more and higher stakes on test results. So much weight has been placed upon them that, standardized tests have become an end unto themselves. Something must change. We do not accept that standardized testing defines the potential or truly measures the growth of our children in any meaningful way. Therefore, as sovereign tribal governments, shouldering the new responsibilities under the state compact, we feel it is our duty to make a change toward authentic assessment and accountability. If Indian students are motivated, they will succeed. It is our goal to create places where our children and young adults wish to be and where there is an inherent expectation and tradition of success. In recent years, the state has commissioned and adopted assessments, such as the High School Proficiency Test (HSPE) and End of Course (EOC) exams, which have only served to make the student disengagement and dropout problem worse. Now, with the coming adoption of the Smarter Balanced Assessments (SBA) testing will take a quantum leap toward becoming much longer, more difficult, and demanding even greater attention. We believe that we cannot test our way to success. We have walked far enough down this path and are determined to change direction. Therefore, we are proposing a five-year moratorium from standardized testing in Tribal compact schools. During this time, we propose to develop a new evaluation paradigm based on applied learning and public demonstration. During this development period, we will use formative tests and/or other tools chosen by our staff to monitor progress and assist in teaching. We will develop a viable alternative evaluation system equaling or surpassing the rigor of state adopted testing. In addition, we will demonstrate American Indian student attendance and graduation rates that match or exceed state averages. Although intended for reservation-based districts, we hope such a system might be used by any district experiencing this chronic syndrome of failure. We will call upon our schools to develop ways to teach content and to hone student academic skills through authentic work for real life purposes rather than to depend mainly upon passive and abstract classroom instruction. These methods may further enhance Indian student learning as they more closely resemble historical tribal teaching practices. Traditionally, our children learned specific skills within the context of an immediate and worthwhile task. As students progress toward later grades, authentic instruction should increase and passive classroom instruction decrease. To support these proposed reforms, we intend to provide our schools an evaluation model based upon public demonstration to the community. We will give our professional educational staff the flexibility to re-organize as necessary and to experiment in developing more deeply engaging educational experiences. In addition, we will find new ways to evaluate and award credit for the work completed outside the classroom. The teachers will work in teams to share the burden and include high school students in yearly planning. We will require our schools to initiate formal public demonstrations of student work that meet the highest level of state standards, so that the tribe and community may appreciate the quality and value of the school. The demonstrations may include but are not limited to: individual or group projects in science and applied math; performance in music and dance; displays of art and literary work; student enterprises and worthy deeds for the school, tribe or community. The demonstrations will be challenging enough to show high skills and/or thorough understanding by students. Such demonstrations will also serve to help WOSPI to evaluate student accomplishments in terms of the state standards. We anticipate that the institution of such events will not only serve as a new method to evaluate student work but will also help rally our communities to support their schools. To us, making sure all students graduate “on time” is not as important as making sure that all do indeed graduate as mature capable individuals with knowledge and skills to go forth in their chosen path. Our students will receive a diploma when each is ready to present herself or himself before the community with a portfolio that shows she or he is ready for college, skilled career training or the everyday work world. By the same token, this also means a student may graduate early by petition if they demonstrate extraordinary ability or talent and can meet the standards. As the vision stated in: From Where the Sun Rises: Addressing the Educational Achievement of Native Americans in Washington State--Delivered to the Washington Legislature, December 30, 2008--"Indian education dates back to a time when all children were identified as gifted and talented. Each child had a skill and ability that would contribute to the health and vitality of the community. Everyone in the community helped to identify and cultivate these skills and abilities. The elders were entrusted to oversee this sacred act of knowledge being shared. That is our vision for Indian education today." Photo credit: by sarah-ji at Creative Commons. Please join Oregon Save Our Schools for an important parent information session particularly designed for parents of incoming kindergarteners. While geared toward this specific audience, all parents and community members are welcome. The sessions are free and open to the public. This is information you will NOT be getting from your school district or teachers prior to the first week of school when most kindergarteners in Oregon are administered the state mandated OKA (Oregon Kindergarten Assessment) also sometimes referred to as the KRA (Kindergarten Readiness Assessment) at all publicly funded schools (including charters). That’s right- these days in Oregon children are introduced to their first high-stakes standardized test in kindergarten-often on the first day or within the first week of school. Most parents don’t know anything about it as it’s presented as being part of a “meet-n-greet” get to know you time. Come find out what this assessment is and isn’t, how its data is and isn’t used, and hear first-hand from actual kindergarten teachers what they think about it and how it informs their work. Learn about how the Common Core standards that the test is based on have quickly changed the way kindergarten is being taught. Get information on the origin and history of these changes and better understand sweeping “education reforms” are impacting our publicly funded schools and how. Information on how to “opt-out” will be available as well. One shorter session will provide information and time to answer questions. The two hour sessions will also include the viewing of the documentary Education Inc. with a discussion to follow. This event will provide important information about kindergarten assessments and opting out. This session will provide important information about kindergarten assessments and opting out as well as a showing of Education Inc., a documentary that examines broadly and deeply how corporate interests are impacting public education. Kindergarten information session will be held for the first hour. Movie showing and discussion will follow. This session has been promising for Oregon. 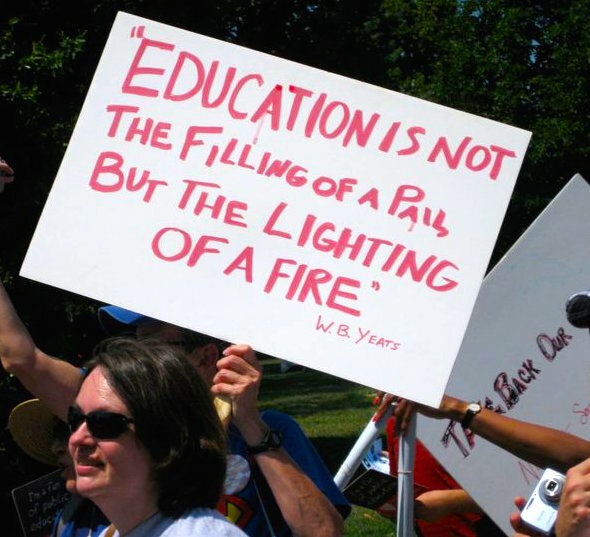 Education issues have been on the minds of our legislators more than ever. However, one bill in particular has been surprisingly somewhat controversial. We are talking about HB 2655: The Assessment Bill of Rights and Opt Out Bill. Now this is a good bill, and Oregon SOS strongly supports it. The Oregon Education Association supports it as well. It is a bill that serves the people, parents, students, the public. It is a bill that fosters information, transparency, and consistency about state testing and opt out rights. One has to wonder why it has been so hard to get it passed with ease. Really, it should have been on the Governor's desk by now. There is a lot of money to be made from high-stakes testing. 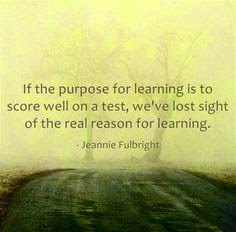 And such testing fosters a business model for our public schools. Such testing fosters a narrative of failure for our public schools. Such a narrative will open up the potential to have our public schools become charters or go into receivership. Such testing will try to break down teacher unions as well. Such testing will label students, schools, and teachers as failures or as a number, and this is wrong. Our public schools should be held as untouchable and protected as a foundation of our democracy. Informing parents to include opting out rights stops the business model in its tracks because it denies the existence of the data they crave to justify their plan and corporate policy making. What this bill does is simple: it creates a single statewide opt out form, informs parents and students of the purpose, schedule, and information provided by state tests before the school year starts, explains their rights regarding opting out, and allows parents to opt their child out of high-stakes testing for any reason. So why is this such a problem for some folks? The corporate reformers such as Stand for Children and Chalkboard feel that without high-stakes testing there is no accountability for our public schools. They also feel that it helps keep students from falling through the cracks if they are struggling. They feel these tests are a simple "check up" and good for kids much like taking your vitamins or eating your spinach. But ultimately, that isn't really the point of this bill. The point of this bill is to allow parents to make an informed decision and exercise their rights in a manner that is simple and easy. This bill passed the House, despite the fact that some representatives, who align themselves with the corporate reformers such as Stand for Children, tried to derail or weaken the bill. A compromise was delivered which allowed the bill to be in effect for six years before sunsetting as Oregon works to make a transition away from high-stakes testing to a more authentic and valid assessment system that our students deserve. Then the bill passed out of the Senate Education Committee with a "do pass" recommendation, with only one 'no' vote by Senator Hass. Now the bill is headed for a vote in the Senate, but suddenly it is stuck in the Rules Committee, as a new amendment (A15) has cropped up that seeks to delay notifying parents for a year of their rights and of the testing information. Who wants to keep parents in the dark for another year? Again, this bill is about transparency. But groups like Stand for Children, Chalkboard, and the Oregon Business Association fear their gains in power and influence with state education policy will dissolve if high-stakes testing becomes a thing of the past. And their fears are hopefully right. Their approach is not good for our schools, and in fact, has shown no closing of any kind of achievement or opportunity gap since the inception of NCLB. And corporate reformers are also highly supportive of Secretary of Education Arne Duncan and all his federal policy making as well. This policy making has supported tying funding to the implementation of such policies. And when you tie funding to policy, that goes down the road of blackmail and loss of state control. Some fear we will lose money if parents know they can opt out and exercise their right to do so. So far no school has lost money. This fear is unfounded and puts the interests of money before children and parents. Our parents need to know the truth and they need to know their options. They need to be able to make an informed decision, and our legislature needs to help them. Please contact the Senate Rules Committee and voice your support for this bill without Amendment 15 and to then ask to have it sent to the floor for vote. Then contact your State Senator and recommend they do the right thing and vote yes on HB 2655A without the amendment to delay notification. Parents deserve to be informed in a transparent way. They can then decide what is best for their family using simple, clear, and consistent information. The state shouldn't have the right to deny them that. Parents will make their voices heard, and at the end of the day, who will they trust? Teachers and those who supported their rights. Not those who stood in their way. HB 2655A received its first hearing in the Senate Education Committee May 5th. Testimony by the public and questions by the committee showed much more awareness and concern about the affects of high-stakes testing and the Smarter Balanced tests. The Senate Education Committee is scheduled to hold a work session on HB 2655 (Opt Out Bill) on Tuesday, May 19th. This bill in critical for two big reasons. First, it informs parents in a clear, consistent, and transparent way about the tests students will be expected to take and why, how much time it will take to administer, how the test results will be used, and when testing will take place. Second, it will allow parents to opt their child out of state tests for ANY reason, so parents will no longer be intimidated, have to justify their choice to districts, and it makes the process simple. One teacher and parent, Mindy Legard Larson PhD from McMinnville, presented her testimony on May 5th with much research. Read about her top ten reasons to support HB2655A here. Oregon SOS thanks Ms. Larson and others who are speaking out against high-stakes testing in Oregon. There is still time to make your voice heard to support HB 2655A. Please email your legislators and the Senate Education Committee (and cc your State Senator), and tell your story or voice your opinion that parents should have the right to clear and transparent information about high-stakes testing and they should be able to opt their child out for any reason. 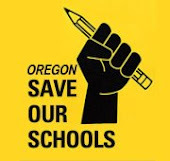 Oregon Save Our Schools (OSOS) had a voice in this process at a feedback forum, but we would like to offer our additional comments. We appreciate the opportunity to give feedback and the work that was done by the committee. ● An excellent, well-rounded, and engaging education for ALL of Oregon’s public school students. ● An end to high-stakes testing used for student, teacher, or school evaluation. ● Teacher, family, and community input that informs public education policy. ● Equitable and well-funded schools that support students and classrooms first. ● An end to corporate education models and top-down government mandates which threaten a strong, democratic, public education system. The following recommendations identify factors to consider in transitioning to a new system of assessment for student learning. These recommendations were developed by members from Oregon Education Association (OEA), Oregon Education Investment Board (OEIB), Oregon Department of Education (ODE) and school district advisors, who worked more than a year on researching, studying and developing a white paper titled, A New Path for Oregon: System of Assessment to Empower Meaningful Student Learning. These recommendations will be vetted with a diverse group of stakeholders and will be revised based on their collective feedback. Recommendation #1: Advocate and prepare for reauthorization of ESEA that allows states to develop a system of assessment that truly supports student learning through greater emphasis on valid, reliable and unbiased high quality classroom, interim assessments and addresses the role of accountability in the system. 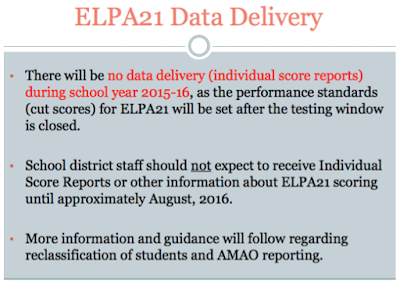 · The end result will be a reduction in the overall volume of tests and the frequency of mandated assessments. Interim assessments will be chosen at the local level with the state providing resources. Teachers will be given autonomy to choose assessments that meet the needs of their students. These could include portfolios and work samples. · Technology-based interim assessments will be used sparingly as to not restrict students’ access to technology. The timing of these assessments needs to be flexible in order for educators to address intervention needs and differences in scheduling. The manner in which teachers document progress will be at the discretion of the district in collaboration with teachers. · Teachers and the district will work together to develop an assessment calendar to avoid over testing and teaching to the test. Any data gathered needs to be timely enough to inform instruction. The entire assessment system needs to be examined to see if students are taking too many assessments in their varying content areas and if an excessive amount of data is being gathered. Recommendation #2: Support the “Student’s Assessment Bill of Rights” to ensure students know and understand the purpose of assessments, the learning targets that make up the assessment and how the results will be used; and also to ensure students understand the differences between good and poor performance on pending assessments and learn how to self-assess and track their progress. 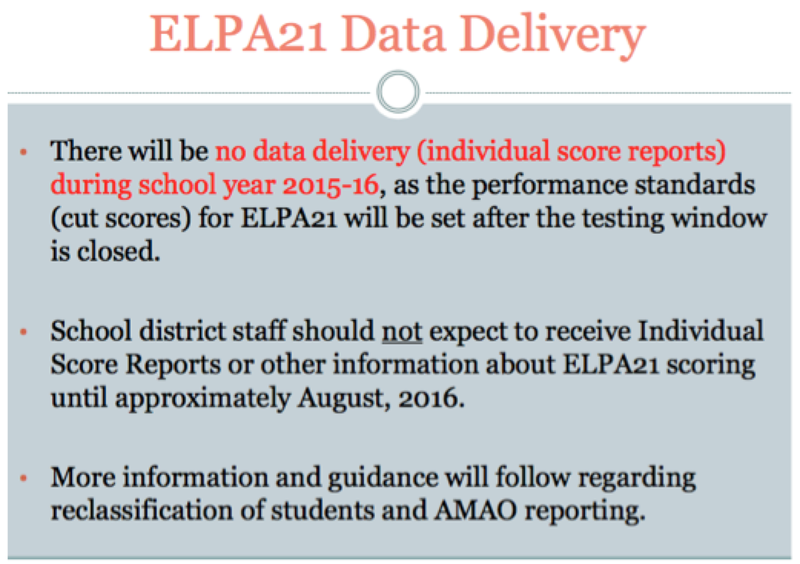 · Parents and students will also be made aware of what data relating to assessments will be kept in state databases. We support students being a partner in their learning process. Students should be allowed to decide how they prefer to show their learning whether it is a work sample, test, or performance task. In doing so, we recognize the individual needs of the learner to choose the best and most authentic way to demonstrate their learning. · Teachers are already highly-trained in the art of assessment. We support their work and believe what they need most is time rather than training in order to effectively assess their students. Because of our misguided current high-stakes testing model, the professional judgment of our teachers has taken a back seat to testing companies as their products are given more value and voice in what constitutes a quality assessment. It is time to recognize the talent and knowledge of our teachers and invest in the resources and time they need to provide quality and timely assessment for their students. Feedback from teachers states that an even more urgent issue is access to time and materials rather than test development. · The assessment process will be made more clear so it is easier to communicate with parents, students, teachers, and community members about student growth and proficiency. · Federal funding should have no strings attached. Federal funding should be provided in a manner that allows the vision and values of this plan/document to move forward in an authentic manner. Recommendation #4: Create a taskforce to conduct an audit of the type and number of assessments currently administered in Oregon schools. Include the amount of instructional hours being devoted to formative, interim, progress monitoring and summative assessments to determine the impact on teaching and learning time. · The task force should include current classroom educators. · The taskforce will meet at a time where classroom educators will be able to participate. · The taskforce will also examine the effects of student morale and stress with regards to the testing process. 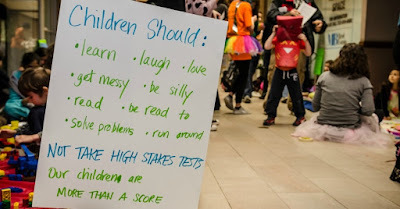 · The most important voices in determining the effects of testing in our schools are teachers, students, principals, and parents. In collaboration, these groups should work to provide a clear picture of how much testing is going on in their schools, how it is affecting quality instructional time, and how it is affecting student morale and learning. We feel districts should provide such information to this task force so they can accurately evaluate these effects in such aforementioned audit. Recommendation #5: Advocate for state and federal funds to initiate and maintain a cooperative statewide teacher resource bank which will provide classroom and interim assessments, learning objectives, materials, and technology integration suggestions. These items in this bank will be designed by certified teachers and housed and run by the Oregon Department of Education. These assessments will also be vetted valid, reliable, and equitable, and made available for districts and individual educators to use. The use of the assessment bank will be optional, retaining educators’ rights to select materials that align to learning objectives. Districts receiving funds for item bank development will post their teacher-created assessments for general use. A comment section will be provided for teachers to provide feedback and suggestions on the individual items. Recommendation #6: Invest in the technology necessary to learning not just for administering standardized tests, and to ensure students have access to technology for college and career readiness. Invest in technology to ensure that students have access to technology for learning purposes during testing periods. We suggest that technology primarily be used to support authentic student learning rather than fostering a testing culture. Provide professional development for educators and paraprofessionals to successfully integrate technology into instruction. Recommendation #7: Examine the current state of accommodations for special education students, English language learners,and other populations of diverse students to determine the impact of the additional testing and determine an appropriate level of assessment for every subgroup of students. Special Education and English Language Learners will be required to take the Smarter Balanced assessment only if meaningful accommodations are provided and the chance of success is realistic and attainable. However, the current accommodations are not acceptable. Alternative authentic assessments designed by the teacher to meet the child at their academic level will be encouraged and allowed. Investment will be made so special populations have access to a comprehensive education that offers enrichment beyond remediation. A task force shall be made consisting of teachers of vulnerable populations to develop recommendations for additional accommodations. In the meantime, parents of vulnerable populations will be informed of their rights to opt-out of state-mandated summative assessments. We already have enough information to document the achievement gap. The urgency is in addressing that gap, not more assessments. Recommendation #8: Research the feasibility of reducing the frequency of administering the annual statewide standardized summative assessment while ensuring accurate yearly disaggregated data by subgroups through enhancing the use of valid and reliable formative and interim assessments. · We encourage the elimination of high-stakes testing when it comes to evaluating teachers, schools, and districts whether it is annual testing or grade-span testing. · We support assessments that are authentic and teacher-created. · Annual assessments are fine as long as they are not punitive or high-stakes, but instead prefer grade span assessments as they take less instructional time, provide fewer opportunities for student stress, and give students a better chance to show growth. · English Language Learners’ progress can be monitored by classroom assessments and the English Language Proficiency Exam. · Special Education students should be monitored by progress on the Individual Education Plan. · Other tests such as the NAEP can be used as an valid assessment piece that can give districts, board members, and ODE a snapshot of student learning and may be considered as they are shown to be reliable and do not intrude on instructional time. Recommendation #9: Advocate for state and federal funds to develop and use high quality formative and interim assessments chosen by educators from a menu of options vetted at the state and district level that meet the needs of their students and high standards of quality. These assessments will be standards-based, vetted as valid, reliable, and unbiased. Students may also develop, in conjunction with educators and administrators, work samples to demonstrate their learning and progress toward common core and other academic standards. · Any purchased assessments will be provided by Oregon companies and written by currently practicing Oregon educators. · The use of any of these assessments will be optional by the teacher and the district. · Assessments may be teacher-created. · Any assessments created locally will be posted to the statewide item bank. Recommendation #10: Allow high school students to opt-in to the Math or ELA section(s) of the Smarter Balanced Assessment earlier than 11th grade so that they take the assessment as it coincides with their actual academic course load rather than the current system which may have students taking a test on content they haven’t studied for two or more years. In essence, allow students to “bank” portions of the test. · Inform high school students to alternatives to the Smarter Balanced Assessment that still count for graduation. · Students with banked OAKS scores shouldn’t be required to take the SBAC. Recommendation #11: Enhance and expand options to demonstrate essential skills. Determine if other measures of essential skills exist and promote the most options for students. · Districts will report to the next legislative session the extra cost associated with Smarter Balanced and the extra staff required to increase access to essential skills and other routes. · Students may provide a portfolio or a work sample to show proficiency in lieu of taking the SBAC or state mandated summative assessment. Recommendation #12: Suspend the use of Smarter Balance Assessment results during 2015 for school ratings on report cards, but allow students to use their 2015 Smarter Balance Assessment results to demonstrate Essential Skills for high school graduation and allow for comprehensive analysis of Smarter Balance to determine the value in relation to student learning. Continue to suspend the use of Smarter Balance Assessment results for educator evaluation during 2015-16 while developing a more balanced system of assessment. · Suspend immediately and indefinitely all uses of the Smarter Balanced Assessment. · Focus instead on developing a system as outlined in this document. · In the meantime, research validity through the results of other states implementing the Smarter Balanced Assessment.